A former BBC Radio 1 producer has been arrested as part of the inquiry into sexual abuse claims against Jimmy Savile and others in entertainment. Ted Beston, 76, from Bromley in south east London, was detained at 06.30 GMT by detectives from Operation Yewtree. He was questioned at a police station on suspicion of sexual offences before being released on bail until February. Mr Beston worked with the late presenter on his Radio 1 shows, including Savile's Travels. In that show Savile travelled across the UK talking to members of the public. Savile affectionately referred to Mr Beston on air as "Uncle Ted". During the day there have been signs of police activity at Mr Beston's house - three men in suits were seen to leave the premises in two cars carrying a large black holdall and three sealed black bin liners. The former producer is being investigated under the strand of the investigation termed "Savile and others" - meaning that the allegations are linked to Jimmy Savile. One of Mr Beston's sons was contacted by BBC News but he refused to comment. Ted Beston is the eighth person to be questioned as part of Operation Yewtree. Seven have been arrested and one suspect was interviewed under caution. So far no-one has been charged. Savile, who died last year aged 84, was a Radio 1 DJ and the presenter of the Jim'll Fix It show on BBC One. 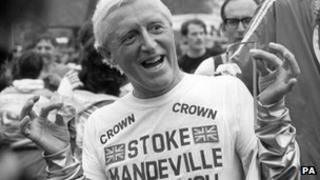 The police say 450 victims have alleged abuse by Savile alone. The arrest comes as the Pollard Review - an inquiry into the BBC's flagship current affairs programme Newsnight's shelving of a report on sexual abuse by Savile - was published. The Pollard Review was set up by the BBC to see if there were "failings" in the management of the investigation. In December 2011 Newsnight dropped its six-week investigation into claims Savile abused youngsters.